Smudgie was somethin' else, let me tell ya. There was nothing that didn't interest her, and nothing that caused her fear. She embraced life and everything about it. Maybe, somehow, she knew that the pneumonia had taken its toll, and wanted to stuff as much living into her little life as possible. Six weeks old when I got her, she fell ill shortly after. 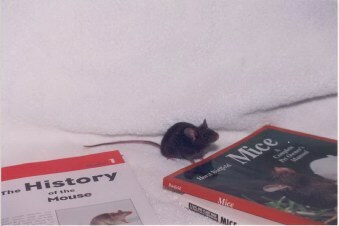 She was the first mouse that I had that had gotten sick--and very nearly paid with her life for my ignorance. By the time she displayed symptoms, she was really sick. I separated her form the other three females (this was before they moved in with Hickory) and took her to the vet, who gave me Baytril and Doxycycline, and told me the truth, that she honestly didn't think Smudge would make it. Somehow, I felt that Smudge wanted to try anyway. Three days passed, I woke every morning preparing myself for the worst. She was always there. I feed her whatever she would eat, gave her anything she would drink and changed the hot water bottle under her little hospital cage every two hours, day and night. The fourth day my husband came home with a heating pad, and I slept like a log that night. Fourth morning, I rolled over and checked as always. 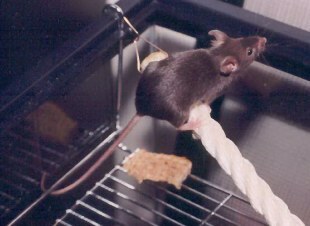 She was wobbling along on her wheel. I couldn't believe my eyes. For three days she had huddled in her little house in a nest of shredded tissue, not moving, except to eat and drink. I cried from sheer relief. I knew she'd heal. And she did. As much as she could, anyway. And for five months after she was a lively, lovely pest. Into absolutely everything. And then one morning she was gone. I learned a lot from Smudgie. A lot.